Bed and breakfast in Shenandoah country inn near Harpers Ferry and Charles Town, West Virginia. 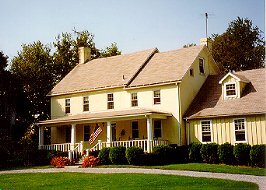 Halfway between Winchester, Virginia and Antietam Battlefield in Maryland, and just 12 miles from Harpers Ferry, the Cottonwood Inn Bed and Breakfast is perfectly situated for historic tours. Tired of traffic, noise and crowds? ESCAPE TO THE QUIET! Relax in our secluded setting, an 1840's farmhouse in rolling countryside just west of the Blue Ridge. Great for retreats, reunions... Privacy for your group. Rockers on the porch. Large picnic pavilion. Quilting spoken. Occasional cows. Colonial decor. Grand Piano. THE ITALY CONNECTION - The Cottonwood Inn is home to italysource.com, internet purveyor of travel & wonderful things Italian. Extensive library. 7 guest rooms with private baths and king or queen-size beds. RATES: $75 to $110 for two with a large country breakfast. This and other Harpers Ferry Bed and Breakfast Inns can be found here in The Register.